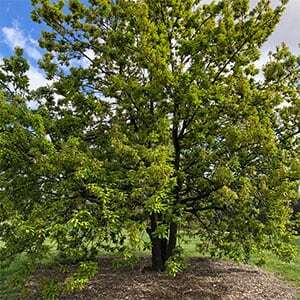 With large leaves and a natural broad growth habit, Quercus canariensis or Algerian Oak makes an excellent shade tree. This is a drought tolerant tree from northern Africa and southern Europe. Evergreen in warmer climates and deciduous to semi deciduous in colder areas. Probably the most drought tolerant of all of the Oak trees it is a very long lived tree and makes a good feature tree in larger gardens. In rural areas it can be used as a shelter belt. 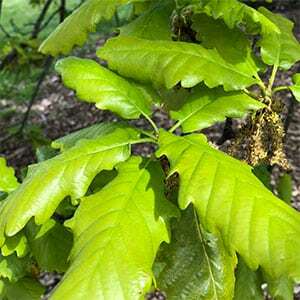 Being very tolerant of soil conditions as long as drainage is good, once established Quercus canariensis or Algerian Oak requires very little care. In rural settings the tree may need a tree guard until established to prevent livestock damage. It is not a tree that demands regular pruning, so maintenance is low. From cuttings or from seed.